Just over two years ago I started my blog. Back then it was on Live Journal and I was experimenting with how to do things. My second ever post was about our first time at Sesame Street Live with NHL. Last February we went to our second Sesame Street Live. JSL had just gotten out of the hospital, so JL and I took NHL alone. It was just the escape from reality that we needed. There is just something about Sesame Street Live. This year we were not planning on going to see the show. Since we are going to Disney World we were going to skip it entirely. Then I realized that my brother and niece were going to be visiting when Sesame Street Live is here. I casually mentioned it to Uncle I. He said it was up to us. We decided it would be a lot of fun to take JSL and Cousin S to their first shows together. JSL does not really watch Sesame Street much. Not to worry though, he knows the characters and has what we think is a favorite already (see title). He loves to sing along with Sesame Street songs in the car, so he will be all set to do that today. This morning I even found the Elmo sweatshirt that NHL wore last year. It is a little bit big on JSL, but it makes today even more special. Here is my little guy all ready to see his Sesame Street friends. More photos to follow soon. We have to make sure to share so Aunt M does not feel left out. She will not be with us so JL will capture lots of memories for her. Have fun, Let me know how the little man likes it. We are taking Taylor next month. 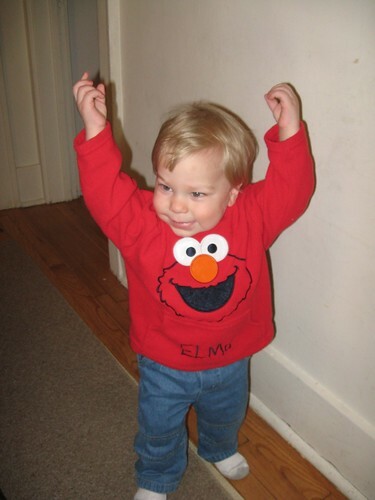 love the elmo sweatshirt! where’d you get it! ?